Exo Terra Jungle Vines can be used for decorative purposes or for enlargement of the dwelling area. These water-proof vines are bendable, twistable life-like vines with a natural feel and look and can be twisted together with vines of different sizes to create a 3-D habitat. Perfect for arboreal reptiles and amphibians. 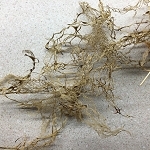 Waterproof Natural feel & look Ideal for arboreal reptiles and amphibians Creates a 3-dimensional habitat Looks even more natural when twisted together with other sizes NOTE: Photo shows TWO vines twisted together for effect. Each Jungle Vine sold seperately.